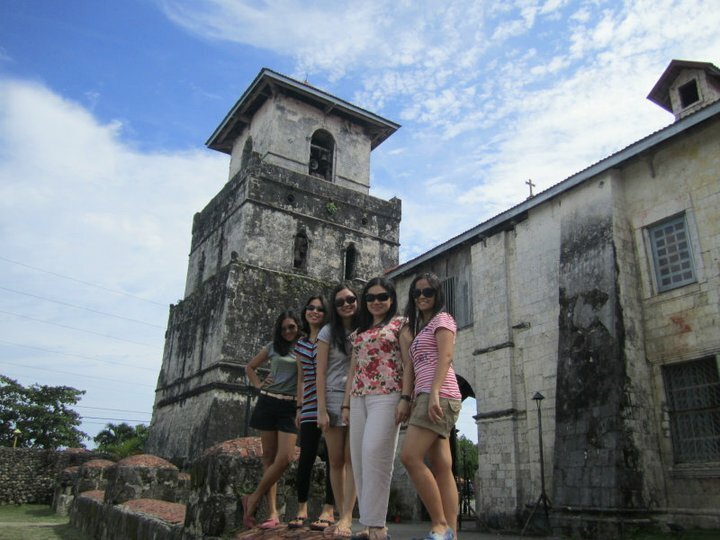 On July 7 to 9, I went to Bohol for the second time and for this trip I was with my friends instead of officemates. We booked our tickets through Air Philippines’ rainy day promo last November. I made a mistake in booking the flights as I booked our return on the same day. My error paved the way to plan a trip to Cebu after Bohol. More on this later. We were left by the plane (see how we wasted both Air Phil promo fares? LOL) on the morning of July 9 because KG arrived at 9:05 am. Our flight is at 9:40 am which required us to check in an hour before. We pleaded to the AirPhil guy at the counter but he insisted we take the next flight available. We scouted for one-way fares and still settled with Air Phil for P1,800. We left at 11:50 am and got there around 12:45 pm, 15 minutes earlier than scheduled. The weather was unbelievably warm and sunny in Bohol compared to rainy Manila. We were not allowed to take pictures by the plane because it needed to be prepped for the next flight out to Manila. We would have wanted to take pictures with the airport’s name but the huge letters were white. I hope they’re planning on painting over it because it’s unreadable in pictures, no matter how big. We were met by Paul, our tour guide/driver. We missed a huge chunk of the tour because of the change in itinerary but he squeezed everything he could the entire afternoon. First stop was the real and fake Blood Compact site (real was where the ship actually docked, fake was where they placed the giant statues depicting the event; I guess it’s a territorial issue what with private land owners in the area), Baclayon cathedral and museum, man-made forest, butterfly garden, and of course, the world-class Chocolate Hills. My friends also did the zipline. I didn’t because I was dizzy the entire morning. They all had fun even when they all felt the first round was scarier. It was a kilometer in total of ziplining with a view of the forest and the river. Last stop for the first day was the Loboc River dinner cruise. The food selection was limited than the lunch buffet but if I were to compare it to my lunch cruise experience four years ago, I’d say this one was better. No, not because the dishes were cooked merely minutes before the cruise nor we’re just plain starving. For one, I rarely like breaded fish fillet but in this one, it was yummy and there’s no oily and malansa taste to it. The lights adorning both sides of the river were simple yet attractive. The cultural dancers were energetic and talented. Most of them were kids and I really hope they have work permits for them because a few could only be as young as 5 years old. Our dinner cruise ended after 8 pm so the driver decided to bring us to the resort to rest. On the way to Panglao, he said he wanted us to see a famous night spot. At first he said it was a ghost in the highway so he stopped and rolled the windows down and urged us to look. Cowards as we were, we were shrieking for fear of seeing a ghastly creature outside. It turned out he wanted us to look at a flock of fireflies in two tall trees by the main road! It was magical, hihihi! Too bad we’re not as talented in playing with our point and shoot cameras. Our shots turned out to be one dark photo with a glimmer of a half-moon. Sayang. We settled in Whites & Greens Beach Resort, a fairly new resort beside Dumaluan Beach Resort and Bohol Beach Club. The amenities were satisfactory. As usual, only saltwater is available in the bathroom. It also has bookshelves in the restaurant which, of course, appealed to me. There’s a small hammock, wooden beach chairs, and nipa huts by the beachfront. It also has free wi-fi which gets a little hard to connect to. The resort manager informed us about it, so if only for honest disclosure, it’s good. We were tired on the first day and factor in ‘freshen me up’ times for five people sharing one room, we got to sleep past midnight. In total, we spent the following per pax – P1,800 (one-way Air Phil ticket to Tagbilaran), P200 (terminal fee), P3,000 (accommodation for two nights and two-day tour), P350 (zipline). Other miscellaneous expenses were for food and souvenirs. Not bad!